Believe it or not, if waxing is performed correctly, it is as relaxing as having a gentle massage. Just because a Beauty Therapist graduated college, does not ensure that she learned perfect technique. Ensure that each pull-off of the wax strip, is perfectly aligned against the hair growth direction. Therapists often make the mistake of mechanically pulling off in straight lines, instead of checking each and every area for hair growth directions. I have failed waxing students on their waxing tests, for this insensitivity. This is important for leg hairs, but even more so, for underarm hairs, which grow in many different directions. Before pulling the wax strip off, use your other hand to press down, right into the muscle, and pull the muscle in the opposite direction to the angle of the wax-strip pull-off direction. These actions completely numb the nerve endings, so that no pain is felt. This is important to do, when waxing the legs, but even more so, when waxing the chest. You must understand that each section of hair growth direction, must be done separately. And for each of those sections, the chest muscle must be firmly pressed in, and pulled in the direction opposite to the pull-off direction. If it is a first time wax, it is essential to cut the chest / pubic / under-arm hair as short as possible, before proceeding, as this will remove the painfulness completely. Once the waxing is complete, apply Lavender Essential Oil to the area. The correct blend is 15 drops of lavender oil in 2 oz of water. Shake before use. Lavender oil is the top product for reducing inflammation, contracting blood vessels, preventing skin trauma, and accelerating tissue healing. If any of the above points are omitted, you will get red bumps, which appear due to traumatized follicles. Bumps can also be caused by poor preparation. The wax therapist must wipe down the area with surgical spirits, before proceeding with the waxing. Waxing creates miniature ‘wounds’, at the hair follicle points, so the area must be sterile. Poor hygiene can cause red bumps. Correctly trained therapists, should have learned that a separate wax container must be used, for each client, to prevent the spread of HIV. Blood often flows a little, during waxing, so you definitely do not want to be having wax applied to your body, in which someone else’s blood spots are present. You can bring your own wax container, or ensure that your therapist uses a fresh container, just for you. And of course, a fresh waxing applicator stick, must be used! Other than passing on HIV, unless you use fresh containers, general bacteria will be passed on to you, from all the previous people who shared that waxing container, causing those red bumps, which are in fact, a mild infection. If you follow all the above advice, there is no reason why you should experience pain, or have irritated red bumps. 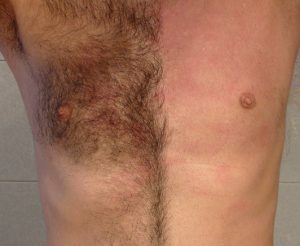 Show this article to your waxing therapist, so that she can improve her technique, and her hygiene practices.